The STC-1 is a small-diaphragm condenser microphone from Sontronics. The microphone features a switchable pad, with settings of flat, -10 dB and -20 dB. 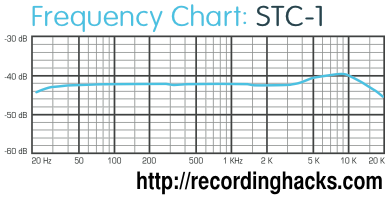 The STC-1 also has an onboard switch for a high-pass filter, with possible cutoff frequencies of 75 or 150 Hz. According to Sontronics (via Huw Price of MusicTech Magazine in 2006), the STC-1 does not use transformers in its output circuit, and features entirely Class-A circuitry in its preamp. The optional Sontronics-made hypercardioid and omni-directional capsules currently sell for under $100, and are affixed to the microphone body by simply screwing them on. Sontronics also sells the STC-1 in matched stereo pairs (known as STC-1S). The STC-1S pair is compatible with the company’s STC-Omni and STC-Hypercardioid capsules, but those capsules are not sold in matched pairs. The STC-1 ships in a padded wooden box and comes with a cardioid capsule, mic clip, and foam windscreen. The STC-1S matched pair also includes a stereo bar. Both single and paired mics are available with black or silver finishes. The Sontronics STC-1 is also known as: STC1, STC 1, STC-1S, STC1S, STC 1S.